Algerian officials are still not on board for the international invasion of northern Mali, and that’s a big concern for US officials. Algerian President Bouteflika says he fears the war will backfire and cause more problems regionally, and without his endorsement, the AU and ECOWAS plan to attack the nation is on shaky ground. Which had Secretary of State Hillary Clinton in Algiers today pressing the president to change his mind or, at the very least, his public opposition, warning that the threat of Mali could spread across the world if it is not crushed by a global military response. The northern two-thirds of Mali have been out of the government’s control for most of the year, first ousted by Tuareg secessionists and later replaced by Islamists from Ansar Dine. With US and French backing, the war is seen as almost certain in the early months of 2013. State Department officials claim President Bouteflika is “beginning to warm” to the idea of a war in western Africa, but the concerns about the war backfiring seem well founded, as the Tuareg attacks in Mali themselves directly flowed out of looting from the wake of another NATO war, in Libya. 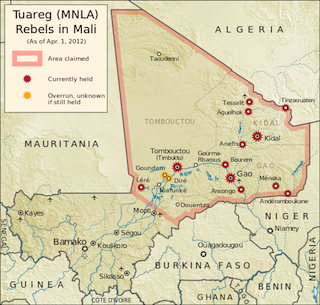 Where the Western desire for war will lead after Mali is anyone’s guess.